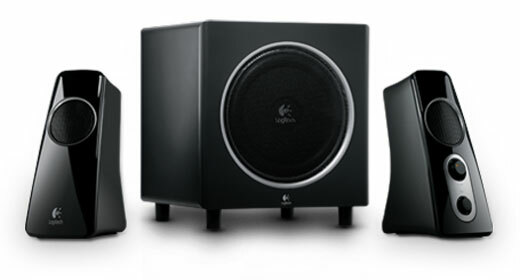 Despite the reasonable investment, this Logitech system sounds strikingly good; just don’t pump up the bass. These speakers are the polar opposites of the Bose Computer MusicMonitor speakers I tested recently on Witchdoctor: they’re plastic instead of aluminium, compact as opposed to tiny and they come with a subwoofer. However, the Z523s are also around a third of the price, so their value for money should be far higher, assuming of course that they sound half-decent. Fortunately, they sound better than half-decent, but let’s start at the beginning. The Z523s are easy to set up. Power goes to the subwoofer (better described as a bass module), which is well finished and uses a 4-inch downward firing paper-cone driver with a supplemental 6-inch passive radiator. A thick cable links the right speaker and the sub, with another thinner wire running between the speakers. Inputs include a 3.5mm mini jack on a cable to plug into a computer or MP3 player, with two additional aux inputs – a 3.5mm mini jack on the right speaker and an RCA on the sub. Controls are limited to an on/off/volume knob and the all-important bass knob, both located on the right speaker, along with a headphone jack. The speakers use two-inch drivers, with one on the front of each speaker and one on the rear in a bi-pole arrangement, giving both direct and reflected sound. This driver setup is what allows Logitech to claim that the speakers provide 360 degree sound, and the soundstage is unexpectedly quite deep and enveloping. The Z523s located vocalists and instruments firmly in the air in front of me on a wide soundstage as if there wasn’t a 23-inch monitor in the way. Treble was well extended and sweet, not tinny or excessively rolled off. The weakness of all subwoofer/satellite speaker systems lies in the integration between the two ends of the frequency range. The problems increase as the size of the satellites decreases because physics dictates that they can’t reproduce low frequencies, so there can be a hole in the range that the sub can’t quite reach up to. This is easy to hear on many of these systems, manifested as a missing lower midrange and a thin sound which is artificially plumped up with too much bass. The Z523’s bass module actually does a good job and integrates well, as long as it’s hardly turned up at all. Like many similar systems, this bass module can play low, but it’s just too uncontrolled at higher volume levels, so I never used more than the first quarter of the bass knob’s range. Anything more than that proved mercilessly boomy with the bass completely overpowering the rest of the music. You can turn it up for games, when some impact is a good thing but for music, turn it up only until you can just discern its contribution and then turn it down a tiny smidgen. You’ll be shuffling the bass control back and forth around the dial depending on what you’re listening to, Massive Attack or Wild Beasts needs a different setting to say, Nina Simone, so its convenient location makes a lot of sense.